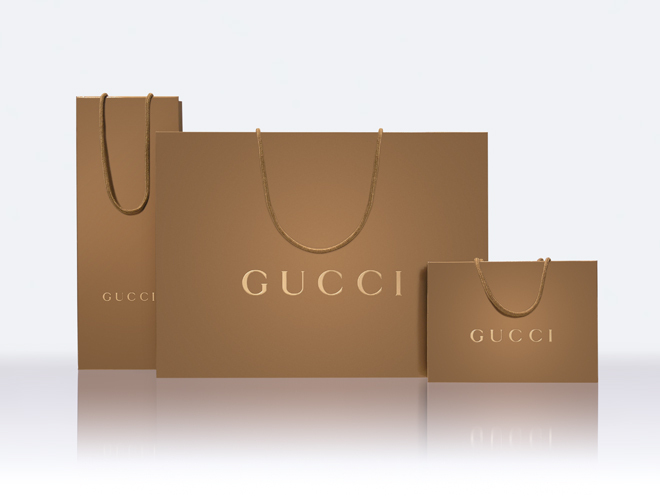 Gucci is taking the initiative to go green by implementing new eco-friendly packaging. The fashion brand wants to reduce dependence on materials and use 100% recyclable paper in packaging, so their revamping all packaging from the shopping bags to the gift boxes and even as little as to the tissue and ribbon that they use. The new shopping bags are Forest Stewardship Council (FSC) certified and are made of 100% recyclable paper. All plastic laminated surfaces have been eliminated from shopping bags and boxes. The tissue paper is no longer coated and both ribbon and garment bags have been switched from polyester to cotton. Gucci is even going to replace all of its mannequins with a much better eco-friendly version, designed by Frida Giannini, which will be made of shockproof polystyrene.